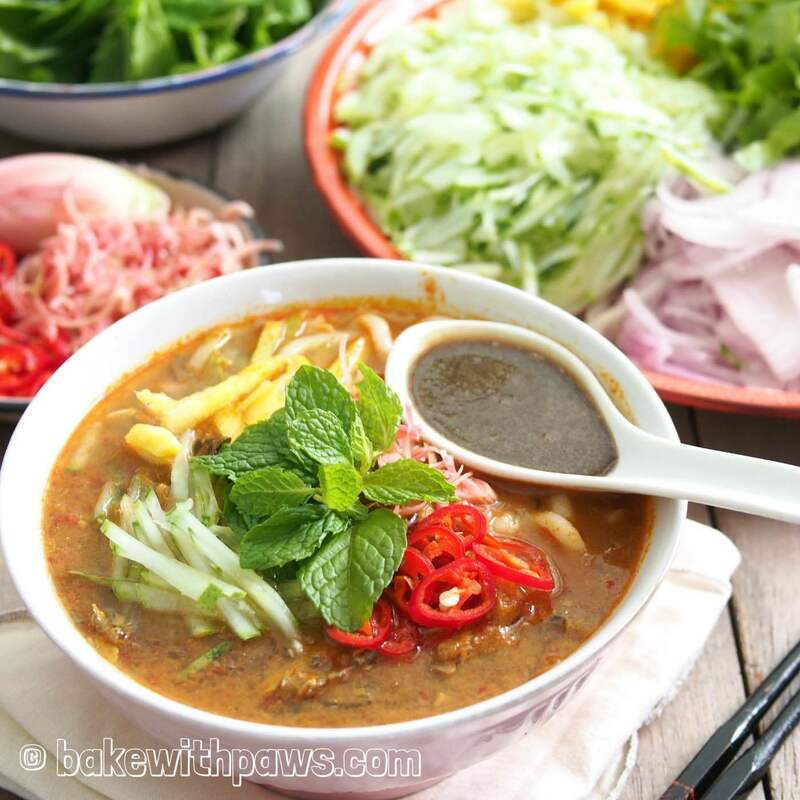 It has been a while since I have made Asam Laksa as it is a lot of work. We had our uncle from Australia as our guest the past few weeks and it was a treat for him. The recipe shared here may involve a little more extra effort to grind the spices and aromatics but, the result is very rewarding. Boil the fish in a big pot of water for around 10 minutes until the fish is cooked. Remove fish from the pot and let cool before deboning the fish. Do not discard the fish broth. Keep the fish meat and broth aside separately. In another big pot, heat some oil and fry the spice paste till aromatic or fragrant. Then add fresh herbs (bunga kantan, daun kesom, lengkuas, lemongrass), asam keping and pineapple. Next add the reserved fish broth, asam jawa juice and some water. Bring the laksa stock to boil then add in the fish meat. Lower the heat and simmer for 1 to 2 hours until aromatic. Season to taste with sugar and salt to the desired balance of flavour. Top with a little of each of the topping ingredients except thick prawn paste. Ladle boiling laksa gravy over the noodles and toppings. Serve with a tablespoon of prepared thick prawn paste. 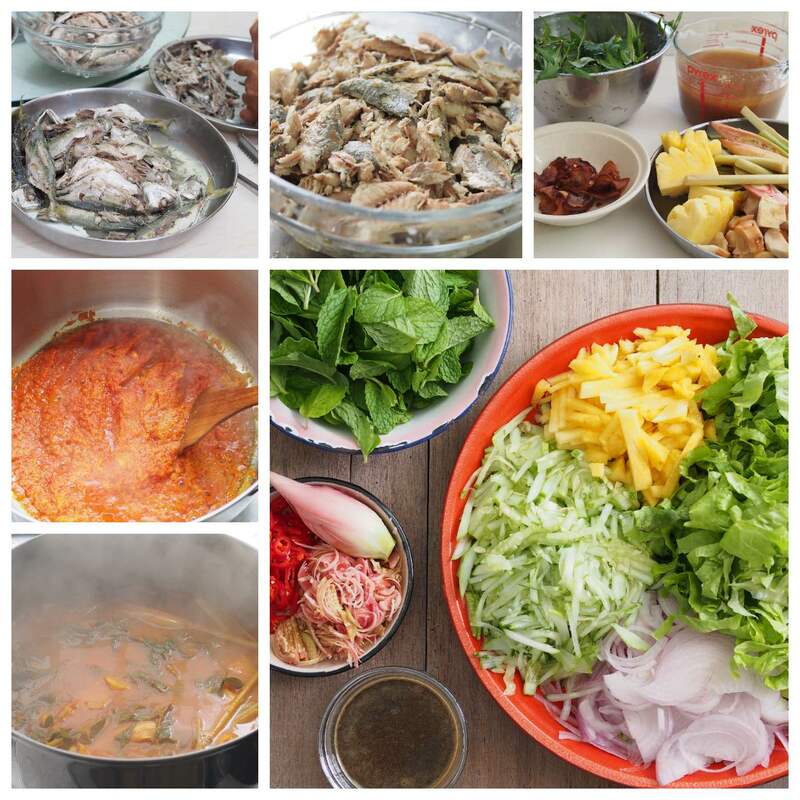 Ikan Kembong is recommended for the authentic taste of Penang Asam Laksa. The above measurements are just a guide, please adjust the salt, sugar, asam jawa and chillies to taste. 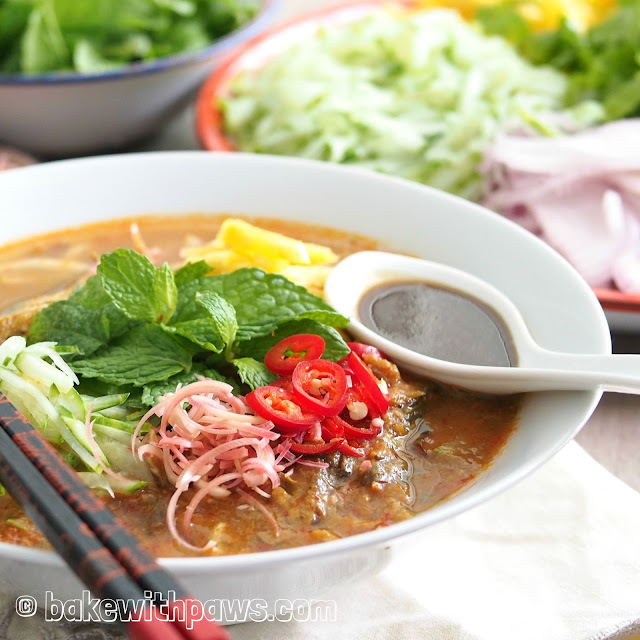 It is best to prepare the laksa stock one day in advance and leave the soup to steep overnight for a fuller flavour.